Throughout his career, the goal of Professor Negele's research has been to understand how the rich and complex structure of the matter of which we and our universe is composed arises from its underlying constituents and their interactions. Currently, his primary interest is in using lattice field theory to solve quantum chromodynamics (QCD) and thereby understand the structure and interactions of protons, neutrons, and other hadrons. Previously, Professor Negele studied, and continus to be interested in, the structure and interactions of atomic nuclei, how this structure can be revealed by electromagnetic probes, the nature and equation of state of the matter in neutron stars, and the physics of classical and quantum mechanical spin systems. In studying a variety of many-body systems, he has been particularly interested in the use of path integral methods, and with Henri Orland, wrote a textbook, Quantum Many-Particle Systems, emphasizing their use. The combination of numerical computation and analytic techniques enables one to make fundamental progress in solving complex problems in many-body physics and field theory that are not amenable to either technique alone. Hence, Professor Negele is leading a collaboration to build a Terascale commodity-based computer cluster that is optimized for lattice QCD, and to exploit it to understand hadron structure. Information about that project as well as other research interests may be found on the lanl.arXiv.org e-Print archive. Professor Negele came to MIT as a visiting assistant professor in 1970, progressing to professor of physics in 1979. Honors received include the Alexander von Humboldt Foundation Research Award and the John Simon Guggenheim Fellowship. 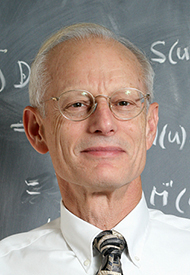 He currently serves as a member of the DOE Executive Committee on Computational Resources for Lattice QCD, and as the Chair of the Feenberg Medal Committee. He is a Fellow of the American Physical Society and the American Association for Advancement of Science. "Monopole and vortex content of a meron pair," (A. Montero and J.W. Negele), arXiv:hep- lat/0202023, Phys. Lett. B 533 324 (2002). "Moments of nucleon light cone quark distributions calculated in full lattice QCD," (With D. Dolgov et.al. ), arXiv:hep-lat/0201021, Phys. Rev. D in press (2002). "Physical observables from lattice QCD at fixed topology," (R. Brower, S. Chandrasekharan, J.W. Negele and U.J. Wiese), arXiv:hep-lat/0110121, Nucl. Phys. Proc. Suppl. 106 581 (2002). "A new approach to eta' on the lattice," (K. Schilling, H. Neff, N. Eicker, T. Lippert and J.W. Negele), arXiv:hep-lat/0110077, Nucl. Phys. Proc. Suppl. 106 227 (2002). "Flavour singlet mesons in full QCD on the lattice," (K. Schilling, H. Neff, N. Eicker, T. Lippert and J.W. Negele), arXiv:hep-lat/0201009 (2002). "Understanding hadron structure using lattice QCD," arXiv:hep-lat/0107010, Nucl. Phys. A 699 18 (2002). "On the low fermionic eigenmode dominance in QCD on the lattice," (H. Neff, N. Eicker, T. Lippert, J.W. Negele and K. Schilling), arXiv:hep-lat/0106016, Phys. Rev. D 64 114509 (2001). "Chiral extrapolation of lattice moments of proton quark distributions," (W. Detmold, W. Melnitchouk, J.W. Negele, D.B. Renner and A.W. Thomas), hep-lat/0103006, Phys. Rev. Lett. 87 172001 (2001).